“Why are we sending this email to this list again?” Kim asked. I was incredulous. “Umm, because we never sent it a first time,” I thought to myself. Still, before responding, I decided to check. Glad I did. It turned out we had indeed sent the same information to the same email list a week prior. And I was the one who wrote that original email. So why had I forgotten about writing it to such an extent that I wasn’t even hit with a pang of remembrance while planning and writing a second, similar email? It seems I was losing control of one of my most basic and important assets. I wonder if anything like this has happened to you recently. In terms of your ability to succeed as a writer, marketer, or digital entrepreneur, what is your greatest asset that you should protect above all others? It has to be your audience, right? Represented as your list of customers, members, and subscribers. Okay, then it’s your website, yes? Which enables you to attract, retain, and convert visitors into subscribers, members, and customers. It’s way more fundamental than that. How about your knowledge and experience? Which enable you to build authority and a website with useful information. It’s even more fundamental than that. What must you be able to do to gain experience, as well as build and retain knowledge? You have to be able to pay attention. You have to be able to focus. Yet, in this era of ubiquitous “war” — the War on Terror, the War on Drugs, the War on Truth, you get the idea — there is another damaging war that we all fight every minute of every day, whether or not we recognize it. And the weapons used against us keep getting more and more sophisticated and pervasive as the cost to us of losing gets more and more expensive. We’re under siege from seemingly every angle. It’s time to fight back … or watch our ability to pay attention and maintain focus erode slowly, but surely, into nothing. At which point, well, good luck getting any meaningful work done. The story that I opened this post with really happened, just a few weeks ago. It was a major eye-opener for me, in part because it wasn’t the first time. Although I’m okay with revealing it in this context, with the benefit of hindsight, I’m glad it didn’t occur more out in the open. And I’m certainly glad it didn’t occur without Kim’s intervention. Otherwise, I’d have sent that second email. Oh how embarrassing that would have been. Even though that didn’t happen, I was still embarrassed — and a little mortified. How had I just … forgotten? It immediately led me to take a step back and seek out the cause. And when I drilled down further, I realized it wasn’t a memory issue at all. When I need to remember something and focus on the information, I can usually remember it. The problem was that my email misadventure was the latest in a growing line of items that I should have remembered, but didn’t. I wasn’t giving enough focused attention to what I was doing. Even while seemingly focused on the single task of the moment, I wasn’t focused enough. How many times did I check my inbox while writing the email? How many times did I check Twitter? How many times did I glance at my phone? How many times did I get up, mindlessly walk to the kitchen, open the refrigerator, close it without grabbing anything, then walk back to my desk? I didn’t know the answers to any of those questions, but the fact that I even felt compelled to ponder them at all struck me as a major problem. I realized, quite starkly, that I had become so used to these kinds of distractions — even uncomfortable without them — that I was now actively seeking them out even while ostensibly in the midst of trying to block them out. In other words, I was getting blitzkrieged in the war for my attention. I had now been smacked in the face one too many times with clear instances of when I could be better. I recognized that deficiencies in attention and focus were holding me back from being my best. And given technological and social trends, without intervention these deficiencies were only going to get worse. So I resolved to improve. The first step was admitting to myself that willpower would not be enough to overcome persistent temptations. I needed to remove the temptations. And replace them. The results have been astounding, so here’s a quick rundown of four steps I’ve taken so far. Perhaps one of them, or something they inspire, might help you take back a bit of the attention you may not even realize you’ve been losing, so that you can focus on your content marketing strategy and get more meaningful work done. Twitter is a great resource and a great tool. It’s also an endless loop of distraction that I found myself checking too often. Now? I can’t get lost in Twitter on my phone, and I have to be far more intentional about using it while working. Plus, I don’t get any notifications that might pull me out of another activity. I have yet to regret anything I missed out on. But even without Twitter on my phone, I found that during any free moments in my day, I would still pull out my phone, open a web browser, and bounce quickly from site to site looking for an enticing headline. A little more drastic, yes. Aren’t there legitimate reasons to look up things online? And isn’t it convenient and efficient to be able to do so on your phone? But I started to wonder how often it really needed to be done on my phone right this second. If it were so important, couldn’t it wait for me to be at a computer? And might I gain something valuable by learning how to not nosedive into my phone so often? I posited “yes.” So far, that has proven exceedingly true. I still find myself searching for something when I have free moments at different times of the day. I’ve just found that instead of staring at my phone and ending up down an internet or social media rabbit hole, I have often ended up in a book … or, imagine this: a thought. Over the last few weeks since I made these changes, I’ve already read two books and am currently breezing through a third. I’m embarrassed to admit that is more than the number of books I read last year, despite great intentions to read more. I either wouldn’t start a book due to the many diversions I would encounter on the way to reading it, or I would get too distracted once I started reading and be unable to make significant progress. I’ve been amazed by how quickly this problem has gone away. I know. Kind of an oddly specific one, right? But I realized that I was giving myself no time during the day to just experience my thoughts. I had become uncomfortable in silence. In a sense, I’d become uncomfortable … thinking. Whether in the shower, in the car, on walks, or elsewhere, I was constantly engaging my brain but not really reflecting on what I was experiencing or intentionally considering what I should do next. It’s tough to convert short-term memories into long-term memories if you never reflect on them. I realized my jumbled, distracted mind was leading to jumbled, distracted actions. Now my morning showers are quiet, but I get a lot more out of them. They aren’t exactly meditative, but they are a great way to open my day with some much-needed peace and clarity. I plan to find more space in my day to do this. Silence really can be golden for the brain. I obviously love listening to podcasts, but I also love this emerging feeling of comfort from hanging out with my thoughts and feelings again. I’d forgotten what that feels like. Plus, I would much rather listen to one podcast, reflect on it, and learn something from it than just power through two or three but have nothing to show for it when I’m done. Phubbing is “phone snubbing” — the act of paying attention to your phone over a person (or other priority) in your presence. I didn’t realize how often I did this until I decided to stop … at which point I found, to my dismay, that I was constantly beating back the impulse to look at my phone for one reason or another, even in the presence of my wife and daughter (who I love spending time with). Now that I’m further removed from the initial difficulty of breaking this habit, I realize how much the barrier of my phone impacted my experiences. And it wasn’t just when my phone was out and in my hand. It was the constant whisper that I might be missing something while it was in my pocket. It’s the same whisper that kept suggesting I check Twitter one more time while I was working. I’ve had to learn how to tune out that whisper. I’m getting better at it and finding a lot more space for attention and focus that I didn’t know I had been missing. Are you even aware of what you’ve been missing? The most terrifying element of the war for our attention is that we often don’t even realize when we’re in the midst of a losing battle. The habits develop so perniciously that we’re unaware of them. We’re like the proverbial frog: drop us into a pot of boiling water and we’ll scream and hop out, but place us in cold water and gradually increase the heat to a boil and we’ll allow ourselves to be burned alive. This is why I’m so glad my email embarrassment happened. It was the boiling water I needed. While I’m taking steps to improve my ability to control my attention and direct my focus, I know I’m only aware of a small fraction of the forces — both internal and external — working to distract me at any given moment. I know I need to be vigilant. I know I need to respect the power of habit and channel it for good. It truly is a war for our attention, being waged by an opposition that fights dirty and with great sophistication. While I resolve to triumph in the war, I’m deluding myself if I don’t think I’ll lose plenty of battles along the way. You’ll lose battles too. We all will. The key is to be able to recognize a loss when it happens and reclaim your attention before any deficit snowballs. That might even include taking proactive steps that protect you from your own habits, until you can replace counterproductive habits with better ones. Hopefully you’ve already started doing this long before I did. And hopefully you have found some strategies for keeping your attention and maintaining your focus that work for you. They might work for others too. I do hope you’ll share them in the comments section below. Let’s help each other. Our attention and focus must be protected at all costs. Otherwise, our greatest — and most basic — skill, our ability to control our attention and direct our focus, will erode without notice, taking along with it our magnificent potential to create meaningful value for others. 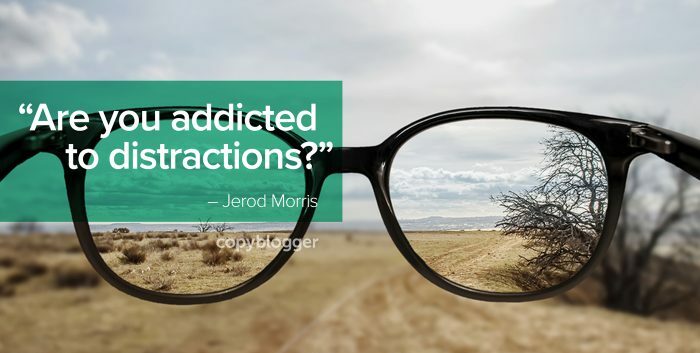 The post Why Your Greatest Asset May Be Slowly Eroding (and How You Can Rebuild It) appeared first on Copyblogger.